It's difficult to understate how immersive every single multiplayer match can become. Ships move into position during the quiet opening moments, pushing forward to hunt the enemy. Finally, a lone opposing vessel appears on the horizon. Then another, and another. A flick of the mouse orders artillery guns to change position, slowly turning to face the approaching ships. One click sets off a deafening artillery blast that overpowers the music, echoing across the water and leaving you in awe. Then enemy salvos visibly close in, exploding around you. Fires blaze across your decks, weapons break apart from damage, and a final torpedo volley literally splits your ship in two. This natural progression, even during a losing game, makes every moment tense and exciting. Now consider that most matches last 10-12 minutes. Win or lose, it's hard not to get sucked in and keep replaying for "just one more round". On the downside, matches on some larger maps take far too long to heat up. Many levels require 30 seconds to a minute for fast-moving ships to get into position - saying nothing of the Battleships and Aircraft Carriers. For newcomers, that means you might spend ages navigating around an island, find enemy ships there, and get blown to smithereens before you can say "You sunk my Battleship". That said, World of Warships does make one great multiplayer concession: Starting new matches before the previous game has finished. Let's say you choose the Cleveland Cruiser, start a Standard Battle, and are destroyed in the first two minutes. 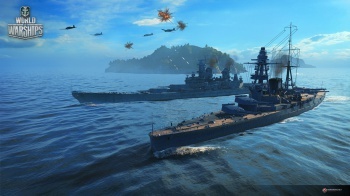 Instead of hanging around spectating, World of Warships lets you return to port and start a new match without a fuss. You can't use the ship already "committed" to battle, but you'll still get full credits and XP from the previous match when it's over. Rather than stick around for a losing battle - or a prolonged victory - you can quickly dive into another game with a new strategy. Best of all, you can experience the full range of World of Warships' content without paying a cent. While you can pay money to access new ships and upgrades, anyone can unlock them by earning credits and XP, or completing daily missions. Besides, even if you have enough money to purchase some high-tier ships, you can't play them constantly. Every vessel has maintenance and restocking costs after each match paid through in-game credits. Low and mid-tier ships usually earn their keep, but if you lose a single high-tier ship? It could cost thousands of credits to make it seaworthy again - which means you're back to low-tier ships until you've saved up the cash for it. In other words, whether you're a paying customer or not, World of Warships is largely the same naval warfare experience for everyone. Any die-hard wargamer or curious player seeking a free game will find lots to love here. 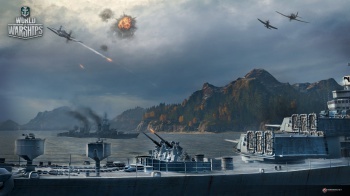 Bottom Line: With its tense naval battles and huge array of historical vessels, World of Warships is the free-to-play MMO that can make a wargamer out of anyone. Recommendation: This game is fun, fast-paced, and free. Why aren't you playing it already?